// errors on each of these locations. // TODO (billg): 5 overloads should *probably* be enough for anybody? // Thanks to the default initializer, `name` will always have type `string` internally. // We don't have to check for `undefined` here. // Externally, `name` is optional, and we can potentially pass `undefined` or omit it entirely. // Notice no `name` attribute was specified! but notice the typo, I did xs.toString() and assigned it to xs itself, not xn.toString(). This does not cause any compilation errors in TypeScript, but the code is essentially a guaranteed null reference error at run-time. In my case it was a month before the little used method was executed. So I slacked off a little on my reading Pro AngularJS and also detoured a bit into reading up on Bootstrap since I am relatively inexperienced with it and the book more or less assumes you know it (or will at least ignore it 🙂 ). Also, the first parameter is not an error object, it is the response data. For example in the case of a 404 error it would be the returned HTML 404 page. Secondly to test the error handling and achieve a 404 error, the author states in a tip to change the URL to something like ‘http://localhost:5500/doesNotExist’. 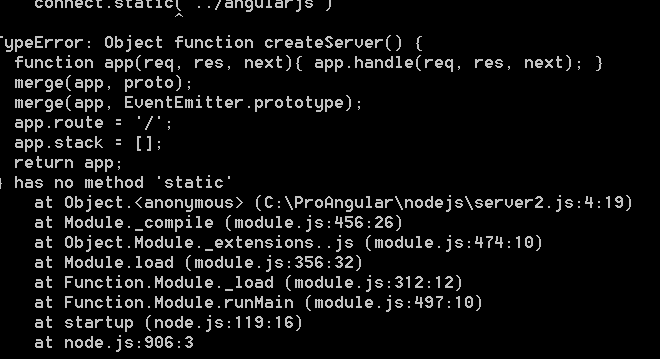 This will most likely not work , as the site is running under nodejs on port 5000, and Deployd is hosting under port 5500, the browser will see this as a CORS request and most likely not return any error information, similar to the angular issue described in the link below. If you want to get a 404 error change the URL to a non-existent relative URL something like ‘/doesNotExist’, this will be relative to the site URL and be a non-CORS request. I started reading the book “Pro AngularJS” written by Adam Freeman. This book was published on April 1st 2014. I’ve read Freeman’s books before (Pro ASP.NET MVC X) and found them to be informative. I followed the instructions in Chapter 1 for “How Do You Set Up Your Development Environment”, which basically entails using nodejs as a simple web server for hosting your angular and bootstrap files. Well, after a bit of investigation, it appears that the connect module has been reorganized, the author most likely used version 2.x, but looking at the connect module release history, version 3.0 was released on 5/29/2014. In fact the release candidate for 3.0 first appeared to be published in March, so that explains why the book doesn’t use the newer version. Alternatively, you can install an older version of connect. Looking over the history indicates that 2.13.0 would most likely be the best choice. Hopefully the rest of the examples in the book run with less research! I found these links helpful in publishing and deploying the plugin. First I signed up as suggested here (https://wordpress.org/plugins/about/) and then I got the relevant SVN information via e-mail. Afterwards, I used TortoiseSVN as described here (http://eamann.com/tech/how-to-publish-a-wordpress-plugin-subversion/) and deployed. 2) Add type annotations to all variable and parameter declarations. Minimize the use of the ‘any’ type. Add interfaces to define function signatures. Use interfaces to describe existing data structures. Don’t refactor any of your code yet, wait until conversion is complete. Note what I consider the typo – the click function was not completely converted, I forgot to strip the ‘= function’ and now it is an assignment to a variable, but it is perfectly valid TypeScript. and it will run correctly. The problem is ‘this’ in the function is not typed as Widget2 but as ‘any’. Now the code will run fine BUT if you make any modifications to the use of ‘this’ in the function you will not get the protections afforded by TypeScript – for example the following class will compile perfectly fine due to ‘this’ being typed as ‘any’, and fail at runtime.